Hi, friends! Today I'm here to share with you the last-but-not-least subscription box from my "Mail Time!" 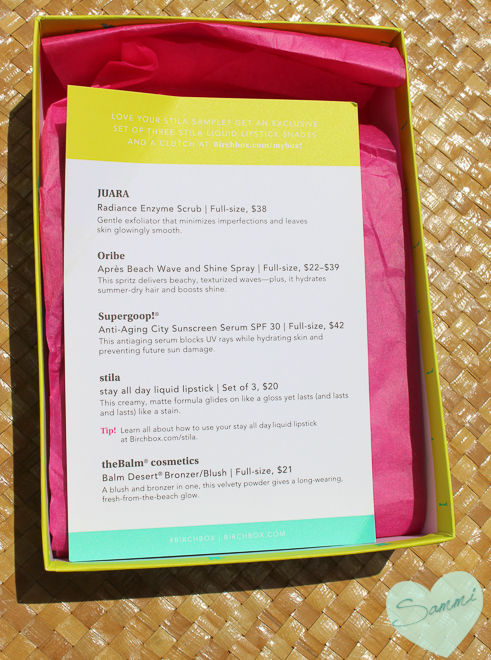 post--my July Birchbox. After this, we are all caught up, and it's time to focus on what's new. Birchbox is a monthly beauty and lifestyle subscription service. It sends 4-5 deluxe samples that are curated to your beauty profile. It is $10 a month, and has a wonderful rewards program, in which you can earn points for reviewing products and making purchases in the Birchbox Shop. You can then redeem those points for full-sized products! It's probably the best rewards program out there, in my opinion, which was one of the big draws in me signing up. They're always adding new products to the shop. In the past, they have sampled products from Amika, Juice Beauty, Shiseido, as well as pages of others! Some products are even exclusive to Birchbox, like Cynthia Rowley's new makeup line and the cult-favorite Beauty Protector brand. If you're interested in subscribing to Birchbox, I would love it if you used my referral link! Thank you! This month I went with the guest curated box (again). I mean, just look how cute the packaging is! This month's theme was "Beachy and Bright," so all of the products had to do with summer and sun and colors and everything is happy in this world (like puppies and rainbows and friendship). I'll never take for granted the wonderfulness of the information card. Why doesn't every subscription service give info cards with their boxes? It baffles me. BAFFLES. I have heard nothing but fantastic things about Oribe, so I'm super excited to try this out. From what I can tell, this is supposed to make your hair wavy, without the dry crispness of most sea salt sprays. I'll be honest: I haven't used this yet, since I am so close to finishing my HealthySexyHair Sea Salt Spray, but this is next in line for sure! One reviewer on Birchbox's website called this "fancy hair perfume," so it could be really good or really bad. Yet another reliable product from Supergoop! They're basically the sunscreen experts of Birchbox subscription boxes. This has basically been a daily product for me since I got it last month. I've been using this as my combined serum, moisturizer, and sunscreen, and my face has never burned. Whether it's a beach day or I'm just going for a walk, this has been so handy. Since I have combination skin, this is the perfect amount of moisture for me in this summer heat. And it's a sizeable sample, too. If it wasn't $42, I would buy the full-size. Maybe next summer if I want to treat myself. Every Birchbox subscriber received one of these liquid lipsticks in their box. 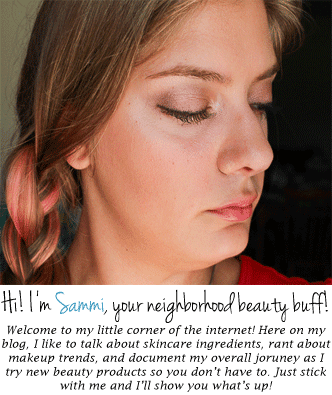 My shade was "Bella," a hot pink, which was the only shade option with the Beachy & Bright box. Now let me tell you, this liquid lipstick was quite an experience. This is not my first time around the block with liquid lipsticks, but I've never seen something like this before. This is pure pigment in a tube, as you'll see by my swatch below. Don't get me wrong--it's pretty, but it's intimidating for someone whose idea of a "fun" makeup look is navy eyeliner instead of black. You also have to be precise when applying this or you'll be a hot mess. To keep this short, it's insanely bright, incredibly matte, and tricky to apply (and remove). I could write a whole review on this product (and I just might--let me know if you'd want to see that), but for now, I'm not so sure this liquid lipstick is for me. 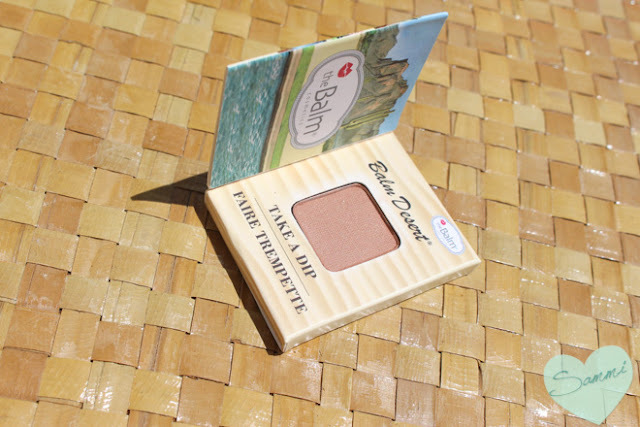 I'm always happy to see a product from theBalm in my box! My bronzer collection is seriously lacking (less so since my July Ipsy Bag) so this was one of the main factors in me picking this box. Originally, I was excited about the blush/bronzer aspect (because the less makeup in the summer, the better), but I'm not so sure about the color for me. When I tried it on, I feel like it just made my face look dirty, but I'll play around with it some more. It's also a little tricky to get your brush in there, since the pan looks like same size that they use to sample their eyeshadows. I'll keep you updated! Look at those swatches! Check out that liquid lipstick. Wow! I wouldn't have guessed this, but the Supergoop! Sunscreen Serum has been my most-used item out of this whole box. If it wasn't so expensive, it could be a summer staple. I probably won't get much use out of the Juara scrub (because I'm an exfoliation snob, whoops). All in all, I'm very pleased with this box. I got a nice variety of skincare, hair care, and makeup products. I actually think Birchbox did a good job this month (for once) of keeping with the theme, between the bright lip, the Oribe spray, and the bronzer. 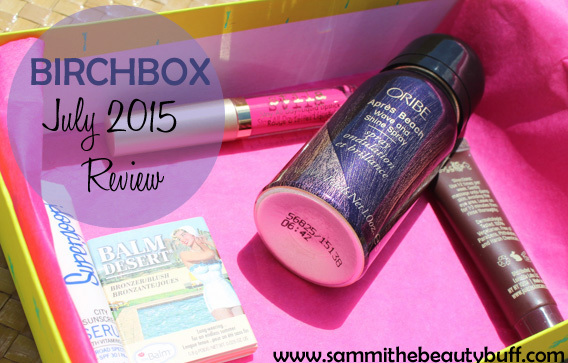 And of course, I'll never unsubscribe from Birchbox, so you know you'll be seeing an August review from me.